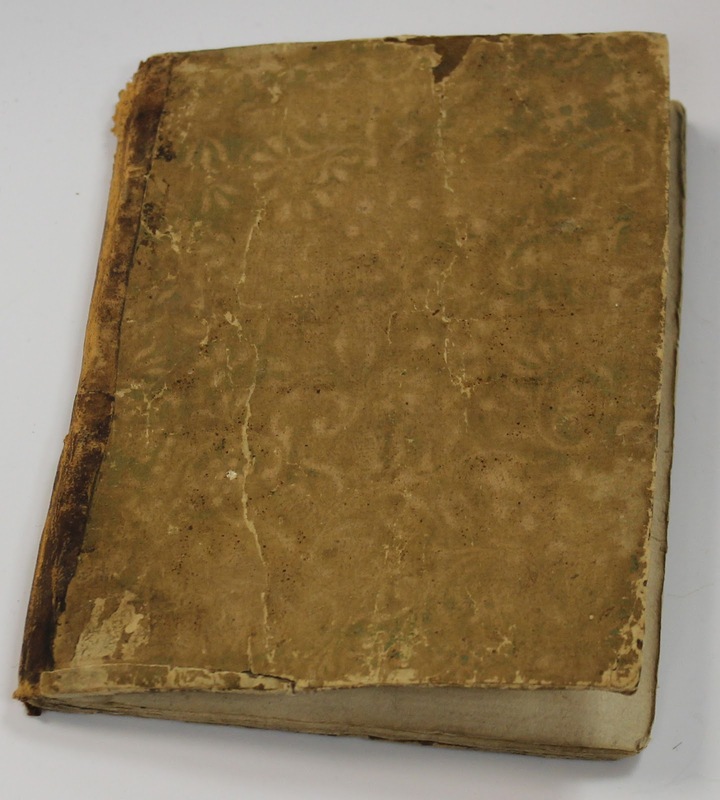 Special Collections is proud to hold a manuscript copy of the Anaphora of Saint Cyril. 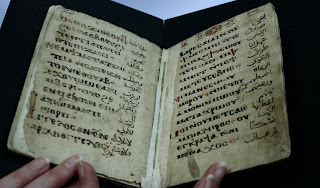 It is written in both Arabic and Bohairic, a dialect of Coptic which is itself the final form of ancient Egyptian before Arabic became the vernacular of the region. Donated to Brandeis by Maury A. Bromsen, this manuscript is part of the Rare Non-Western Manuscripts collection. 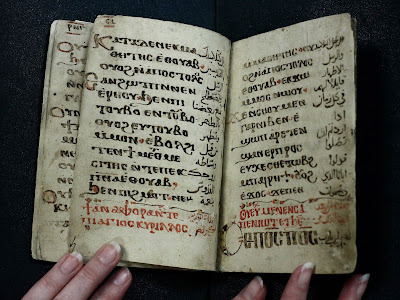 The text is 14 pages long, with a written surface of roughly 5.5” x 4”and dates to the 13th-14th centuries. Each page contains two columns of text, fourteen lines per page, with Coptic on the left, and Arabic on the right. The word anaphora is from the Greek αναφορα and means “offering”. It is the prayer in the Mass that is said when the bread and wine are turned into the body and blood of Christ, thereby affecting the Eucharist. It is considered the most solemn section of the entire liturgy. The Eucharist is the height of religious experience for many Christians and commemorates Jesus’ sacrifice on the cross. The word is originally Greek, ευχαριςτια, and means “thanksgiving”. References to the establishment of this tradition at the Lord’s Supper in the canonical Gospels are Mark 14:22-25, Matthew 26:26-29, and Luke 22:13-20. A Pauline reference can be found in 1 Corinthians 11:23-25. The Didache, a non-canonical early Christian text, first uses the term "eucharist" in reference to this ritual act. The prayer begins by proclaiming God’s position in the spiritual realms over all dominion, authority, and orders of angelic beings. It then continues on into a description of how Jesus sanctified the bread and wine at the Lord’s Supper right before his death. Reciting this prayer, the priest repeats the words and actions of Jesus in order to sanctify bread and wine all over again. This creates a sweeping cosmological and historical context for the Eucharistic act which is the culmination of the entire liturgy. 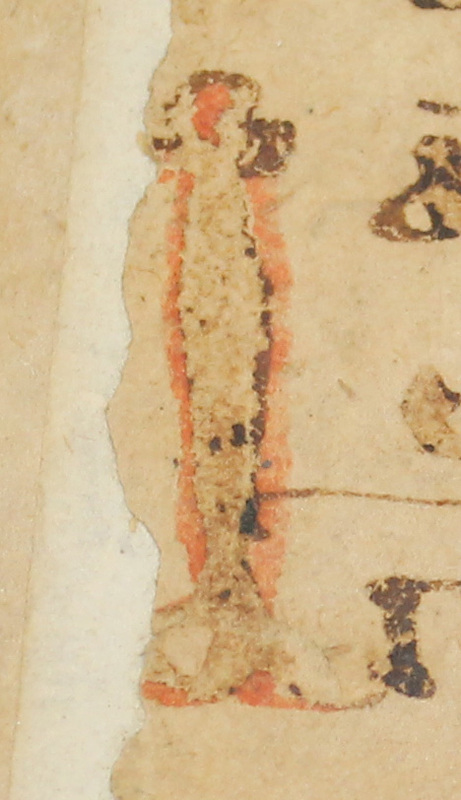 This manuscript contains only the Anaphora of Saint Cyril, with no other parts of the ritual included. The Anaphora of Saint Cyril is still used today as a traditional prayer by both the Coptic Orthodox Church and the Coptic Catholic Church. It has been combined with the Liturgy of Saint Basil and can be used during Lent. It is rarely performed in the modern day. This anaphora, which is known as the Liturgy of Saint Mark when it is in the original Greek, is part of the Alexandrian Rite, which is to say that it is in the tradition of the Coptic, Ethiopian, and Eritrean churches. It was Saint Cyril who originally translated this liturgy into Coptic. description by Clark Aitkins Jr., BA Religious Studies, Indiana University of Pennsylvania & MTS New Testament and Early Christianity, Harvard Divinity School.